"There are many benefits to a rent to own agreement when it's done with a reputable company like Conner Properties. We're with you all along the way during the process. Read below to see how the process works!" 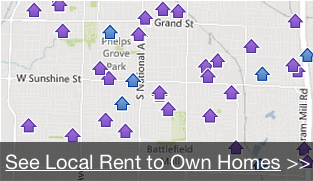 We’ll send you local Newport, NC and Surrounding Areas rent to own / lease option homes that fit your criteria. We will review your credit and income information. If your income qualifies, and you have a good down payment..even if your scores are low, we may be able to appprove you for a lease/option if we feel good about getting your credit scores up in a year or so. We’ll agree on a monthly rent amount and the future purchase terms. Then just sign the documents and move on in! Move in and pay your rent payments on-time… just remember, this is not a rental. If we allow you to move in, our intention is for you to own this home at the end of the lease term. The down payment you give will go towards your purchase price when you go to closing..the rent is strictly rent. It is not applied to purchase price. Your lease/option agreement (also known as the rent to own contract) will spell out the length of time that you have to complete the purchase of the property – typically 1-2 years, but in certain circumstances we may extend your option if you need more time to get your credit up to the point where you can qualify for a bank loan. First step – sign up to find great properties around Newport, NC and Surrounding Areas just by filling out the form on the upper right of this page.